Community, culture and sustainability – our first project celebrating Native American Heritage Month is a true example of how design can be influenced by local culture to produce a beautiful and highly-functional facility. Baca Dlo’ay Azhi Community School in Prewitt, New Mexico was one of the first education projects designed by Dyron Murphy Architects, and it was the first LEED certified building in New Mexico. From the overall footprint of the building to the imprinted detailing on the walls, Baca Dlo’ay Azhi demonstrates the importance of local influences on building design. 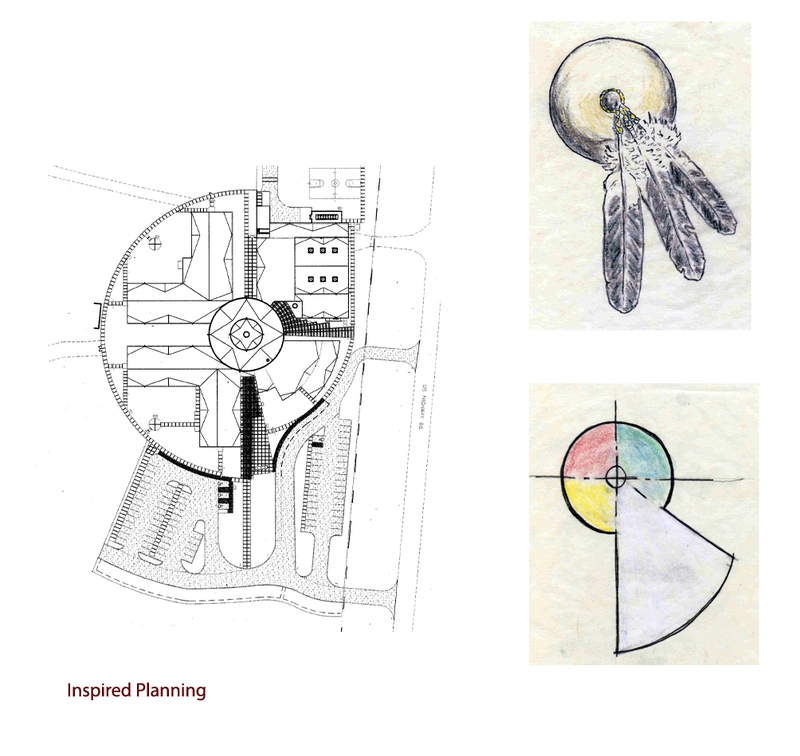 The DMA team drew inspiration from Diné culture, symbolically incorporating functions and colors associated with the Circle of Life into the project design. The main entry faces east toward Mt. Taylor, which is one of the four sacred mountains to the Diné people. Other design elements addressed the four sacred directions with the four wings of the building radiating from a central core. At the central core is the library where students and staff can gather under the light of a central skylight. To connect the building to the site, the spaces between building elements are landscaped with native plants, creating an interplay between the man-made and natural worlds. 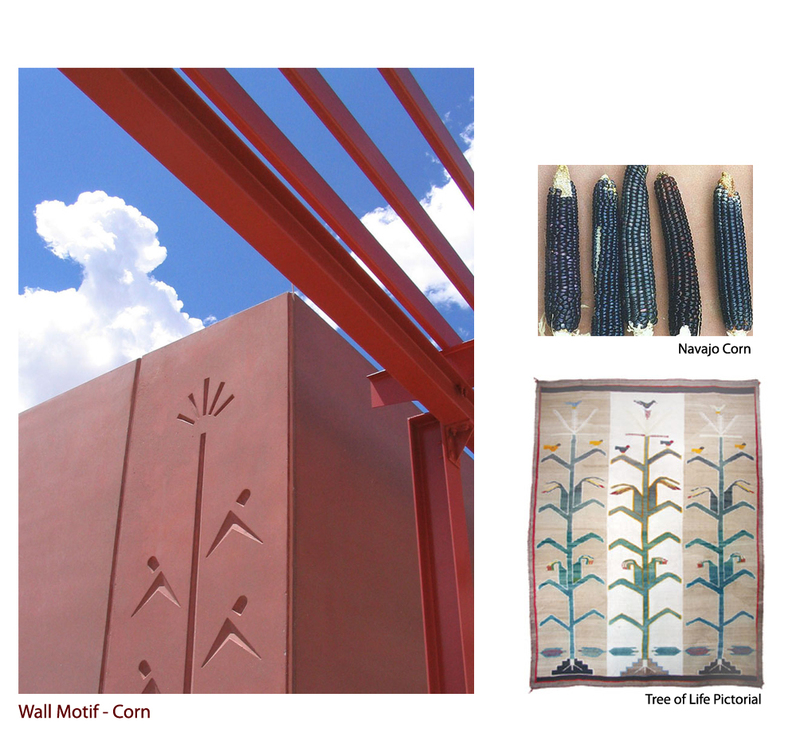 Corn motifs are imprinted on exterior walls, noting another significant element in Diné culture. Baca Dlo’ay Azhi Community School received a White House Closing the Circle Award Honorable Mention, Sustainable/Green Buildings Category, in 2005. The school also received the Department of the Interior Energy Award in 2004. Learn more about our Native and Education projects on our website.